United States' Bobby Wood, 9, controls the ball before scoring his team's first goal during a 2018 World Cup qualifying football match against Honduras in San Pedro Sula, Honduras, Tuesday, Sept. 5, 2017. The legs were heavy and the tension high in the 85th minute at Estadio Olimpico Metropolitano, where exuberant fans had been cheering and blowing vuvuzelas nonstop. 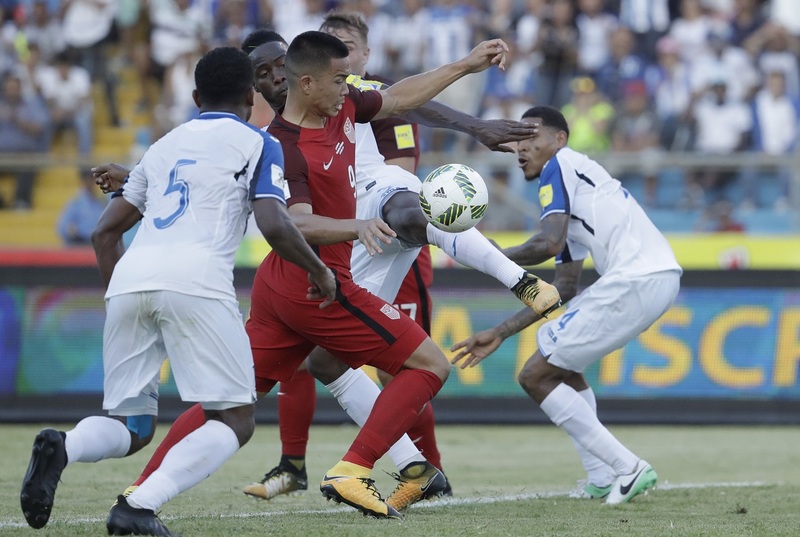 The United States was losing to Honduras in a World Cup qualifier played in searing late-afternoon tropical heat, just a few minutes from falling into a deep hole that would jeopardize the Americans' streak of seven straight World Cup appearances. "Huge point. Great point," U.S. captain Michael Bradley. "In a lot of moments it has nothing to do with football. It's about finding a way to survive and dealing with everything that gets thrown at you, having a group that can hold up in the toughest moments." Playing from behind after Romell Quioto put the Catrachos ahead in the 27th minute , the U.S. remained third in the North and Central American and Caribbean region with nine points, ahead of Honduras on goal difference with two qualifiers remaining. Panama had seven points and was in position to overtake the Americans later Tuesday when it hosted last-place Trinidad and Tobago. The top three nations in the six-team group qualify for next year's tournament in Russia, and the fourth-place finisher meets Australia or Syria in a playoff for another berth. The U.S. hosts Panama on Oct. 6 at Orlando, Florida, and finishes four days later at Trinidad. "We knew what type of spot we were in. We knew we needed at least one point," Wood said. "We knew we started bad. We weren't mentally there. We let off an easy goal, but we knew we just needed one goal and that would change everything." Wins in the final two games would ensure a World Cup berth, but for the first time since 1989 the Americans will head into their finale uncertain of qualifying. Before Wood's goal, they might have put themselves in position to fight for a playoff spot at best. "I was thinking we might have an early vacation at the end of this year," U.S. coach Bruce Arena said. Quioto put the Catrachos ahead when he ran onto a pass from Alexander Lopez just inside the 18-yard box and broke in when defender Omar Gonzalez made only a slight touch on a crucial slide tackle. Left with an open 11-yard shot, the Houston Dynamo's Quioto beat goalkeeper Brad Guzan with a shot that bounced in off the far post, causing fans to stomp and shake the stadium. "He just kind of like fell over the ball a little bit and Quioto regained it and finished," Arena said. Just as in Friday's 2-0 home loss to Costa Rica, the U.S. mounted few dangerous chances. That changed when Christian Pulisic, the Americans' emerging 18-year-old star midfielder, was fouled about 30 yards from the goal and Kellyn Acosta took the free kick. Goalkeeper Luis Lopez made a sprawling save to bat the ball with his left hand. It landed near the end line, and Matt Besler beat Johnny Palacios to the ball and while falling backward hooked it in the air to Jordan Morris at the edge of the 6-yard box. Morris outjumped Henry Figueroa and sent a backward header to Wood, who made a nifty chest trap and shot. "Sometimes in a game like this you have to score scrappy," Morris said. "Was kind of just trying to keep the play alive." "Just kind of expecting it to land right in front of me and it did," Wood said. Arena made seven changes to his starting lineup, saying Europe-based players were not fully fit just weeks into their club seasons and were unprepared for the heat, which was 93 with high humidity at kickoff. Wood entered in the 73rd minute and scored his ninth goal in 34 international appearances. "The door for Russia, there's not even a crack open right now," Arena said. "There's a lot of work to be done to get to Russia." Notes: The State Department in Washington said it couldn't speculate on whether Syrian players would be eligible for U.S. visas. President Donald Trump's temporary ban on visitors from Syria and five other countries allows the administration to make case-by-case exceptions, which could ostensibly be used to allow the players in. The travel ban is set to expire in late September.